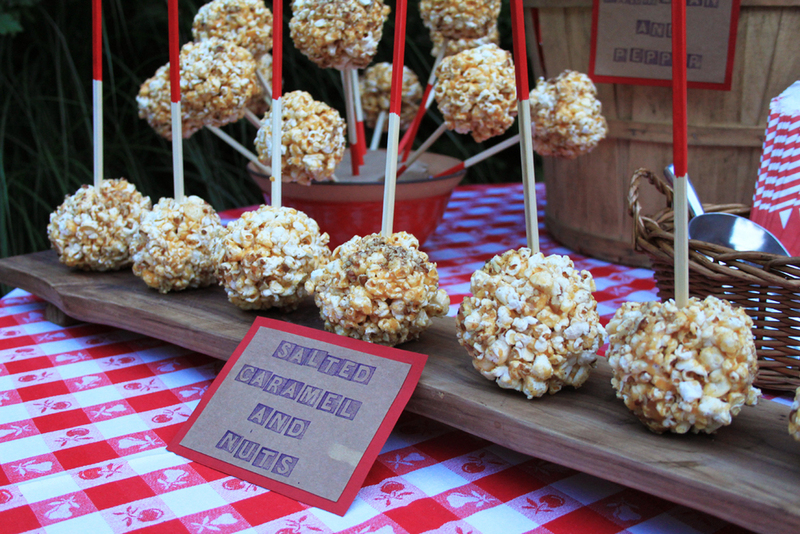 These popcorn balls were a huge hit at our Outdoor Movie Night party. One small tip when making them: easy on the salt. I may have put a bit too much salt on some of them. I never use coarse salt when cooking and I think I underestimated the power of giant rocks of salt. Using a large kettle, pop the popcorn on the stove by heating the vegetable oil over high heat and placing one kernel of popcorn into the pot. When the kernel pops, pour the rest of the kernels into the pot and cover. Continuously shake the pot back and forth over the burner until all of the popcorn has popped. Immediately remove from heat and pour into a large bowl. In a microwave safe bowl, melt the caramels and the butter. Split the caramel and butter melting into two batches and split the popcorn into two batches. Pour the caramel and butter over the first batch of popcorn and stir until well coated. While stirring sprinkle half of the salt into the mixture. Use your hands to form the popcorn in to softball sized balls. Roll the balls in the chopped nuts. Repeat with second batch and serve on chopstick, on a platter or bagged.